It’s raining in Portland, a shocking February truth, I know! Travis and I sit with Tacoma, our black furry mule-eared friend, surrounded by documents and computers and emails and lists and coffee, did i mention coffee? Scanning through lists and letters has reminded me, once again, of how amazing the Portland community is. The goal of this update is to send out the BIGGEST most BRILLIANT shout out to businesses and individuals alike who have donated to EcoJaunt thus far! 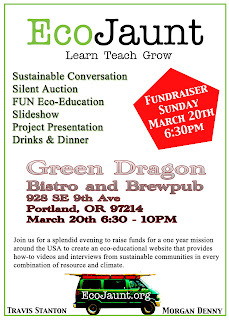 So come one, come all to Green Dragon (928 SE 9th Ave) on March 20th at 6:30pm! The first 25 people there will have a pint on the house! 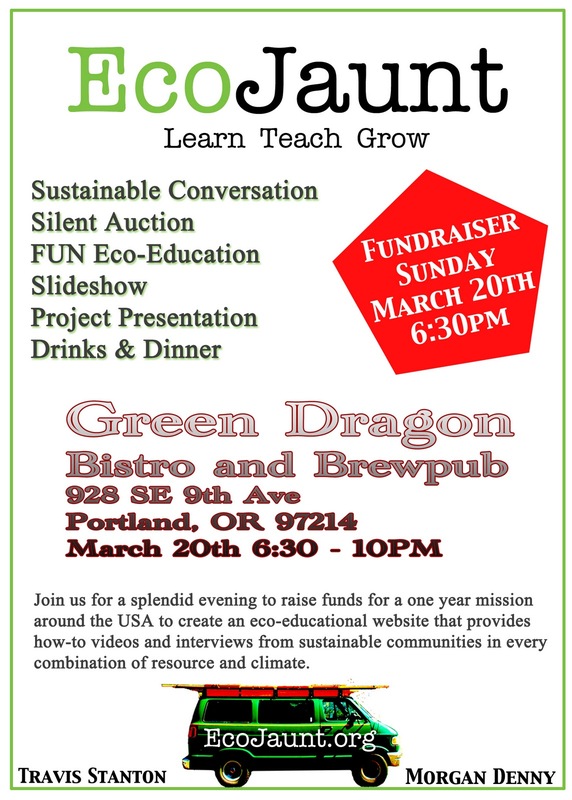 There will be heaps of interesting silent auction items, necessary and not to life and survival ;) We will be presenting a slideshow and video presentation about our project, and playing games and drinking amazing beverages while having wonderous and thought provoking conversation (one can hope ;). Come and play and connect! Our excitement for this project is growing like the crocuses and daffodils that are currently showing their brightly colored petals and reminding us that spring is coming; and that things will change and grow and that there are more colors than gray and green that paint the Ptown landscape! Cheers to sustainable choices, creating change towards a better world, and lapping up the crazy amazing everything surrounding us each day! See y’all the Green Dragon on the 20th!